Vincent Van Gogh is one of the most famous and talented painters of the world. His works are beloved and visited around the world. In Amsterdam 3 million visitors a year visit the Van Gogh Museum. But did you know Vincent Van Gogh never lived in Amsterdam? For the fans of Vincent Van Gogh, the ones that can´t get enough, we organise this tour. A tour where you get to know the background of Van Gogh before he left the Netherlands to live in France. Vincent Van Gogh was born in ´Noord Brabant´, a province in the south of the Netherlands. Vincent lived in Nuenen from 1883 till 1885 where he produced a lot of his work. The Van Gogh Village Nuenen exhibits his letters and painting in the museum. In the museum you will get to know Vincent Van Gogh and how he developed his self in such a great artist. Outside the museum there are 23 locations which were used as objects in his paintings which you can still visit. This excursion includes a 2-way train ticket from Amsterdam to Eindhoven (the city close to Nuenen). At Central Station we will welcome you at the Visitors Desk (you can find the location on your voucher) where you will get a bicycle per person (included in the price). * When you don´t want to bike you can also choose for a bus ticket at the Visitors Desk in Eindhoven. 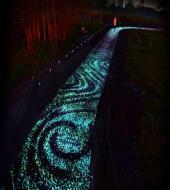 There is a special Van Gogh bicycle path going from Eindhoven to Nuenen. It lights up in the evening with Van Gogh Museum paintings on the road. We recommend to go to the museum by bike because you will see many of the locations Vincent van Gogh painted. The bike ride takes 15 minutes and you will get a map from the Visitors Desk. *When it is bad weather you will be handed a bus ticket to Nuenen. This bus ticket is also included in the price. When you prefer to go by bus you can tell this to the organisation. Bicycles from Eindhoven to Nuenen (or bus tickets) (will be given by the Visitors Desk in Eindhoven). It takes 15 minutes to bike from Eindhoven to Nuenen. Any time: You can determine when to go back from Eindhoven to Amsterdam. The trains departure 2 times an hour till 23.00h. Don´t forget to return the bikes! Don´t miss out this great experience! Get to know Vincent Van Gogh and his inspiration in the South of Holland!